A statement; Life is Strange. As a title, it evokes a notion. The broad implication is that this game will tell a narrative examining the human condition. And it does deliver on that promise. The unusual nature of existence is examined through the story of a few days in the life of the only playable character, Max Caulfield. Before delving more into the narrative, there are a few things that need to be explained first for those unfamiliar. In terms of the genre of works it fits into, Life is Strange most resembles a playable television show. The creators, Dontnod Entertainment, took obvious inspiration from the small screen, and the game contains multiple references to one series in particular: the 90’s cult hit Twin Peaks by David Lynch. It is perhaps easier to discuss the differences between Twin Peaks and Life is Strange than to point out their similarities. The two works share a general setting; a small town with dark secrets touched by the supernatural. The main characters have parallels; Dale Cooper struggles to solve Laura Palmer’s murder, and Max attempts to puzzle out Rachel Amber’s disappearance. Life is Strange even borrows multiple motifs; Dale and Max’s vague visions, the ominous owls, and the backwards speech in a certain lategame sequence. 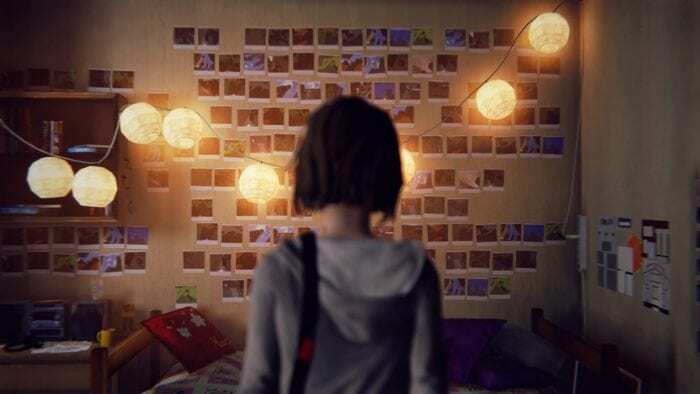 More generally, Life is Strange resembles a television series in that it is episodic, and fits the entire arc of the story nicely into the whole “season”. Most of the narrative is delivered through cutscenes, with some segments of gameplay interspersed here and there. Some would say the balance between watching and playing is a little skewed, but this seems more a product of conditioned expectation. This game is not a run-of-the-mill AAA title, nor does it pretend to be. The gameplay itself treads no new ground. The principle mechanic that differentiates Life is Strange from just another teenage drama is that our heroine discovers the ability to travel backwards in time, albeit quite limitedly. Some of the sections of the game that require the use of this power to solve puzzles in order to further the narrative can seem tedious, but overall the mechanic is adequately novel. Its most interesting function is when it is paired with the primary delivery of narrative tension: player choice. Have you ever made a decision in a game that you immediately regretted? Perhaps the consequences of your actions were unclear, and it was only in hindsight that you wished to take an alternative. In Life is Strange, this problem does not exist. After most major choices, marked by a time-freeze screen-strobe effect, the player is allowed to see the immediate consequence of their choice, and decide whether to live with that reality, or travel back in time and walk down a different path. This is certainly different than most games that give the player freedom of choice, but not so much that it invalidates the choice altogether. Some decisions have effects that are only apparent long after the decision is already set in stone. The time travel mechanic is used incredibly well to weave the narrative. In particular, the segment where Max travels back in time to alter her best friend Chloe’s life is perhaps the strongest use of the idea in the entire story. Reminiscent of Butterfly Effect, the future that Max comes back to after saving Chloe’s father from his deadly car accident is quite different. The resulting gameplay sequence is easily one of the most emotionally affecting parts of the narrative of the entire game. Ultimately, this alternate reality is abandoned for the more familiar world the game begins in, but it leaves a lasting impression on both Max and the player in front of the screen. The narrative itself can seem at times to be somewhat incoherent, especially in the first two or three episodes. There are many seemingly disparate parts that just don’t seem to fit together until the end is in sight. Much like the puzzle that Max frets over, it isn’t until the last piece is placed down that the whole picture becomes apparent. In this way, it adequately keeps the player interested in the outcome while at the same time managing to tell a more ambitious story than it would have if it was less complex. Ultimately, the game relies on the strengths of its characters to keep the player engaged throughout, and it does quite an amazing job in this regard. 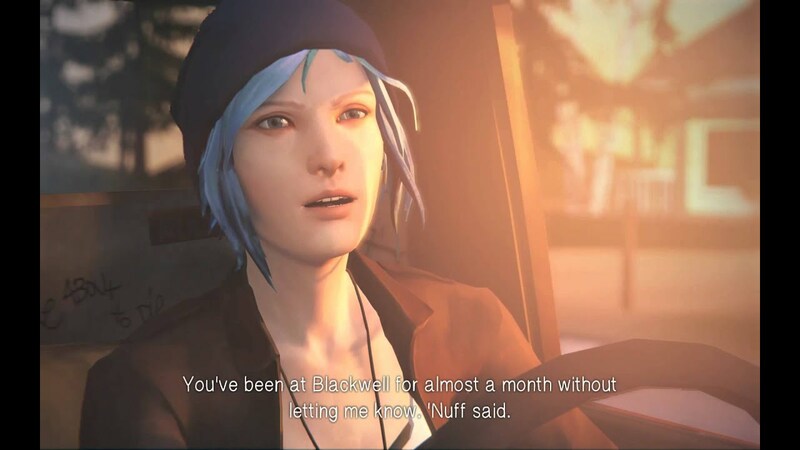 Max and Chloe have a wide range of interactions, from their awkward first words in Chloe’s truck to their rather intimate portrayal in a more private setting later on. The game is not overly long, and no opportunity is wasted to show something about a character, to communicate who they are, how they are feeling, and where they belong in the context of the story. The successes of this communication become much more apparent as the narrative progresses. Rarely, if at all, is a character simply one-dimensional. Many of the cast appears cliche upon first inspection, but the deeper one digs, the more one is rewarded in terms of the depth of character. In particular, the evolution and characterization of David Madsen, Chloe’s “step-douche”, is a fine example of how the writers of the story subvert the usual expectation of such a character and manage to make him seem more human. The primary means of learning about these characters is obviously through dialogue with them, and that is perhaps one of the more obviously flawed things about the game overall. For how much it relies on the words these characters say, some of the idioms and slang used throughout the story seems over-the-top, especially in the beginning of the game. Some of this can be excused, as the studio (and thus the primary writer of the game) is French. Given that the lines had to be translated for the English voice acting, it is understandable that the localization team for the game took some liberty with how the teenage characters talked. It can be immersion-breaking at times to hear some of the quirky phrasing, but overall the dialogue remains sufficiently believable and does improve as the game goes on. The complementary means of communication in the narrative is the visual aesthetic. No matter the limitations of current hardware, the game manages to be nothing but strikingly beautiful throughout. The fully-realized world of Arcadia Bay provides a variety of visually interesting settings in which the story takes place. The depiction of the individual characters always adds to their personality and manages to imitate reality with just the right amount of imperfection as not to seem uncanny. Again harkening back to television, each episode of the show has a unique opening and ending sequence that contains within it the most artistic elements of the visual style. The framing of each shot always manages to be visually interesting and informative simultaneously, an impressive feat in a game. It is refreshing to see a game creator that will actually attempt to put effort into detail, into something that the player does not actively take a role in. While there are some grand moments that are undoubtedly spectacular to witness, much of the brilliance of the game and its aesthetic is in the minutiae. Given that, it seems only fitting that one of the major themes within the game is one of photography. It ties together many of the elements of the story in a way that nothing else could have. Photography is a way of freezing a moment in time, of capturing something so that the image lives on and can be recalled at any time. That Max uses her photos as a gateway to the past is metaphorical for how people interact with their memories, each page of a scrapbook a window into an experience waiting to be relived. What truly brings together the narrative and makes it a unique experience is the brilliant way that the story ends. After many less than successful attempts at rewriting the past, and after living out her own personal nightmare in which all of her faults and failures were shoved in her face, our protagonist Max finds herself at the lighthouse in the midst of the storm, staring at the tornado about to bear down on Arcadia Bay. This entire experience has built up to this moment, and ultimately Max is left with a choice, a choice that threatens to invalidate the effort and the sacrifice of the past five days. Up until this point, the philosophy behind the player’s choices seem rather deterministic. While many choices have consequences, they ultimately do not change the path of the story. Some choices make some situations easier or perhaps give the player more opportunity to play the game as they wish, but Max still goes through mostly the same events no matter what choice is made. The balance between the causal reality and the free will of Max/the player is quite finely tuned, with the ultimate implication of the game a statement on the limits of choice in a complex universe. At this final choice, however, the player is given an opportunity to choose what Life is Strange is ultimately about. Faced with the limits of her power, Max is forced to weigh the cons and choose between the lesser of two evils: either she must sacrifice Arcadia Bay here and now in order to keep her friend Chloe alive, or she must go back in time, all the way back to where the story all started, and let Chloe die so that the town’s inhabitants can go on living. Ultimately, the player must reflect upon the events of the game and decide what to make of it. Perhaps Max is a utilitarian. Perhaps she sees the good in the people of Arcadia Bay despite their flaws. Perhaps she can’t live with herself if she let them all die. Or perhaps she can’t let go of Chloe. Perhaps she’s bought into the idea that it’s just the two of them against the bleak, uncaring world. Perhaps she remembers the dark reality she almost lived out a number of times and would rather see it wiped away. I think the problem with this piece is it did not go deep enough into the subject matter and not enough concrete examples from the game. It's mostly for people that have already played, more or less. I also didn't want to go into detail because I think describing what happens in the game does it a disservice. I feel my explanations would be inadequate. If you haven't played it and read the piece, I recommend playing it if it sounds at all interesting. Just finished the game not long ago, happy to see someone wrote about it. I bought an instant camera because of this game (well, part of the reason anyway). I really liked how much detail they put into the game, the graffiti and also the subtle hint of mystic power etc. Liked the music as well. Apparently a second game will be coming let's hope it is awesome like this one.